For those of you who still haven't selected a Halloween costume for this year might I suggest the Paul Jung mask, brought to you from the good people at Kellogg's in Battle Creek Michigan. All you need to add is a long tie, 10 road boxes full of props and a gaggle of "little people". 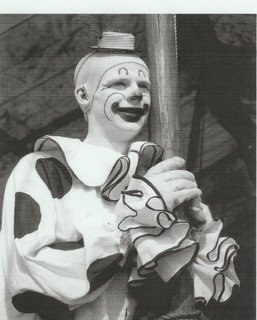 Danny McPride, a clown I haven't been able to find anything on. I'm guessing he must have had a comedy dog act since every photo of him includes this dog. 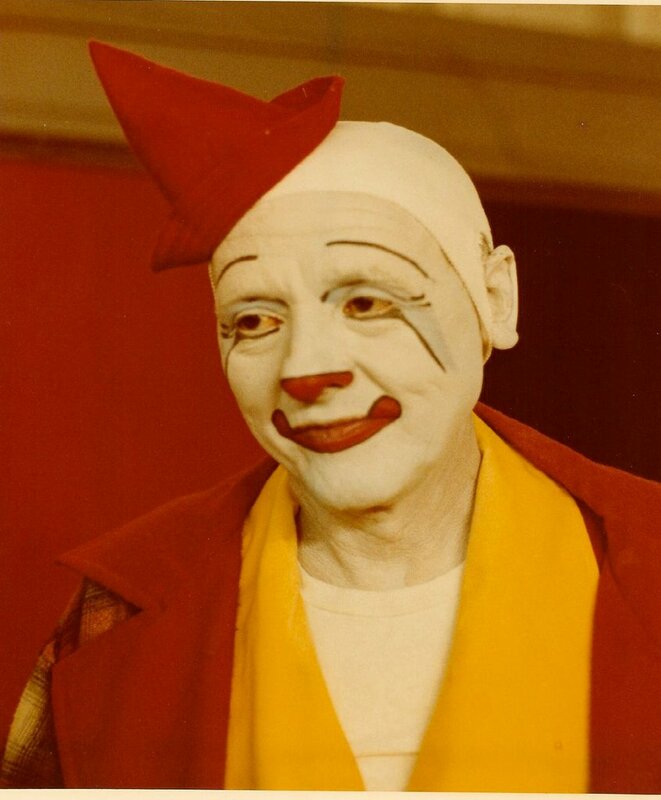 I think that Danny is a notable clown if for no other reason than for the number of natural lines in his face that he missed when designing his makeup. Yesterday's photo of Paul Jerome raises several questions. 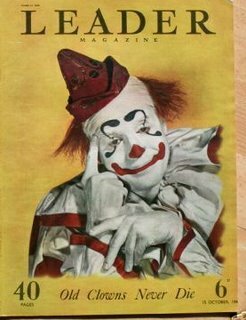 If this photo was tken at the dawn of the New Deal then why wasn't Paul Jerome working in his whiteface on the Ringling show as the 1930's era programs would have us believe? How much time did he spend on Ringling during those years? Just when DID Jerome start using a tramp character? Did he use his whiteface strictly for Ringling program pictures and his tramp for his work on Hagenbeck-Wallace? Bill Strong sent along a side by side comparison of his "mystery tramp" photo that we had previously decided couldn't be Paul Jerome, but the makeup on the right is identical to to the makeup of the tramp on the left who couldn't be anyone BUT Paul Jerome. Bill Ballantine with an important message for all of us. A man who could give Chesty Mortimer or Jerry Bangs a run for their money in the "What-Were-You-Thinking-When-You-Came-Up-With THAT-Makeup" Sweepstakes, Mr. Buzzy Potts. 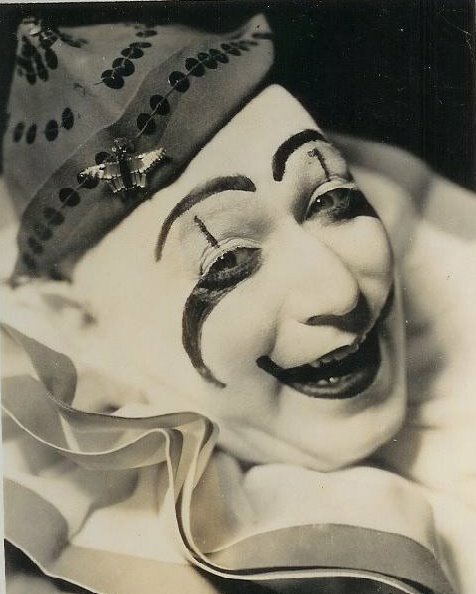 As weird as his makeup seems, Buzzy was featured extensively in the DeMille film THE GREATEST SHOW ON EARTH. Horace Laird on the Cole Bros. Circus. 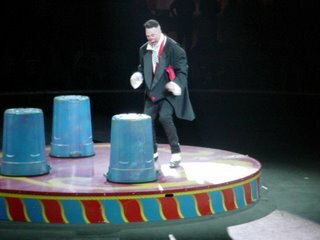 Meschach Taylor introduces Richard Simmons performing a nice bit of visual comedy assisted by (and probably created by) the World's Coolest Magician, Rudy Coby on Circus of the Stars. 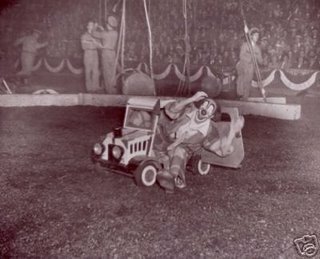 Paul Jerome and Earl Shipley on the Hagenbeck-Wallace Circus in a photo that looks like it may have been taken by Edward Kelty back in the 30s. 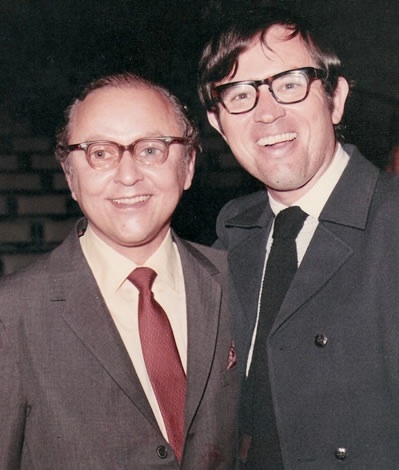 If you look closely you'll see that both are wearing Bobby Clark-style painted on glasses. 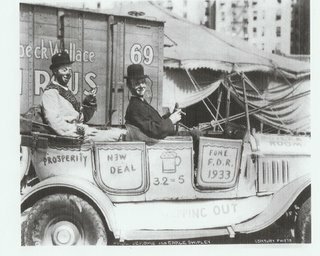 Bobby Clark and his comedy partner Paul McCullough started out as circus clowns before moving on to vaudeville, Broadway and movies. Clark developed his painted-on glasses while circus clowning and kept them throughout his career. 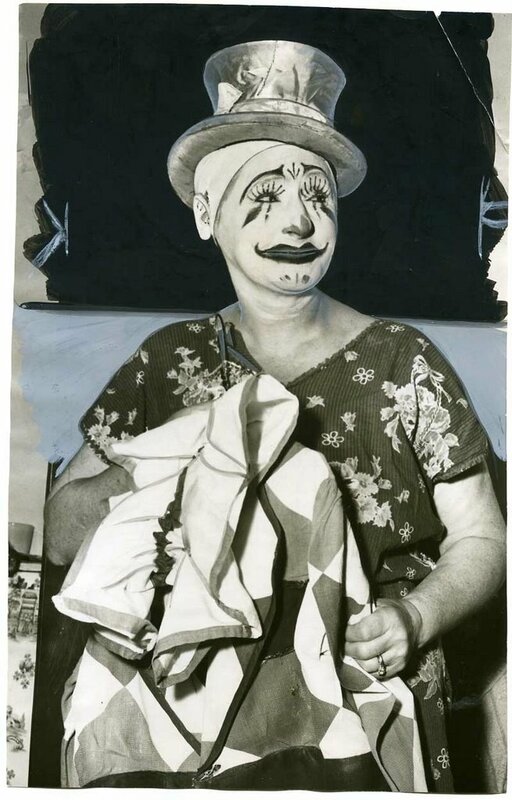 Earl Shipley was doing Ringling advance work when he retired in the late 50s/early 60s and gave all of his costumes and props to his nephew, 1960s Ringling clown Billy Ward. Classic American neat whiteface, longtime West Coast clown and Bobby Kaye's best friend, Harold Hall. NO ONE's clown character springs forth fully-formed and complete right from the start. 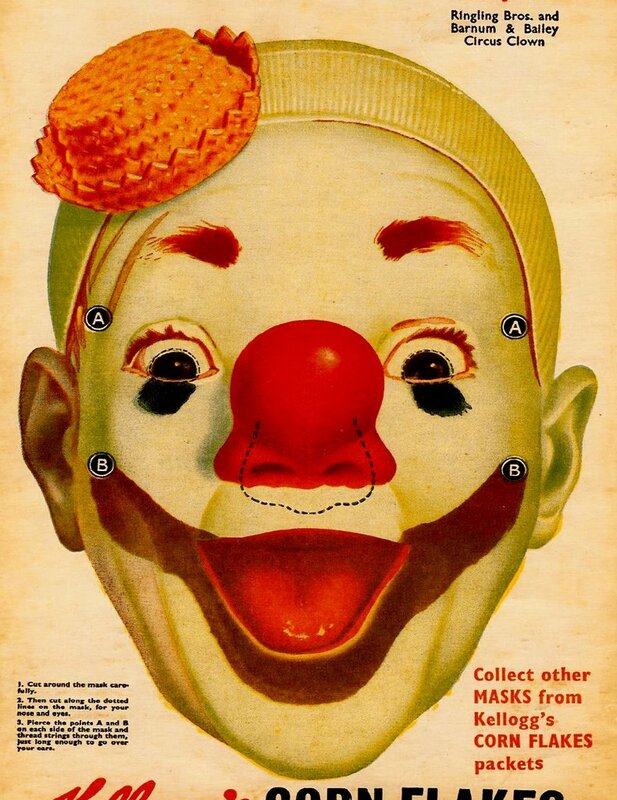 It takes years and years to find the makeup, wig, costume and props that are "you". Here's a perfect example. 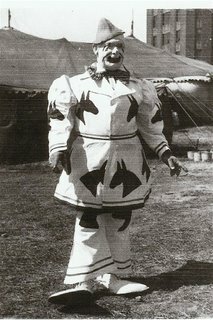 This is a photo of a young Harry Dann, a man who would soon develop into one of the greatest "picture clowns" in the history of the American circus, with a makeup and costume that were widely imitated in his day and his image continues to be influential around the world. 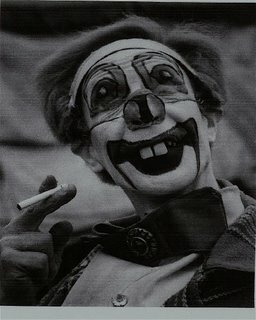 Here he looks "professional", by just about anyone's standards, but hasn't yet found the elements that will spark something that will make him truly unique. 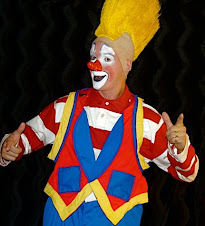 Here's former Ringling Red Unit clown and (along with Steve Patient) juggling instructor for my class at Ringling Bros. and Barnum & Bailey Clown College, Mr. Joel Heidtman. 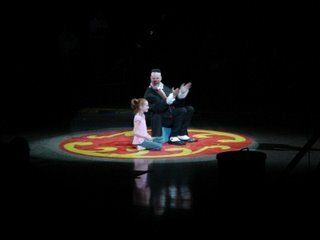 He's a great guy, a great performer with a great sense of humor and he's the father of one of the cutest kids you've ever seen. Send this around to everyone you know and let's see if we can't make Joel the next Chris Bliss. 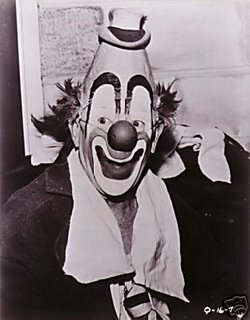 A photo that I would guess (from Felix Adler's makeup) to be taken in the 1950s. On top, Felix Adler, the longtime "King of Clowns" on the Ringling-Barnum Circus. 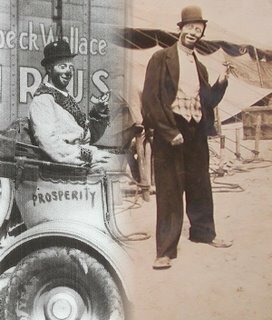 On the right, Charlie Bell, longtime classic neat whiteface in the old-time tradition and comedy dog trainer extraordinary. 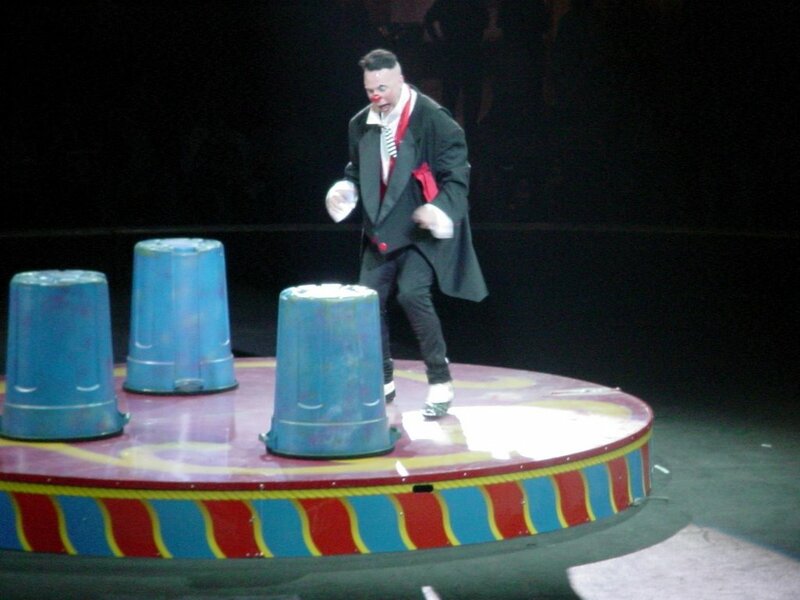 On the bottom, Paul Jung, ace Producing Clown and in addition to creating scores of classic walkarounds, track gags and ring gags also created gags and props for clowns on other circuses, stage shows and ice shows. 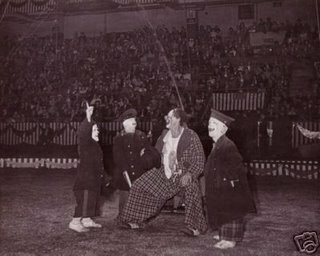 On the left, Paul Jerome in whiteface. 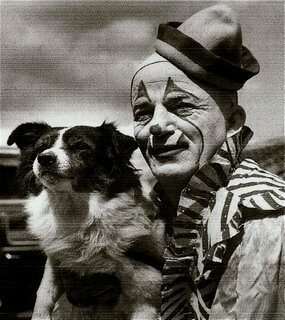 Jerome had a memorable tramp character as well. The lost link between Slivers Oakley's Baseball Gag and ICHOF inductee Billy Baker's Elwood Smooch character. Not sure if or how well two of these pix might reproduce but thought you might enjoy them, particularly the magnified view of the diploma signatures. In recognition of the publicity successes, I was made an "honorary graduate" of the first Clown College (then called College of Clowns) session. 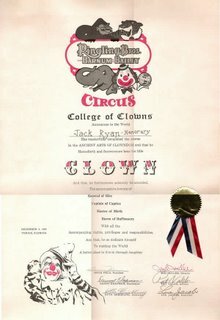 As you will note, my "diploma" is signed by: Irvin Feld, Danny Chapman, Otto Griebling, Mel Miller, Pat Valdo and Lou Jacobs. 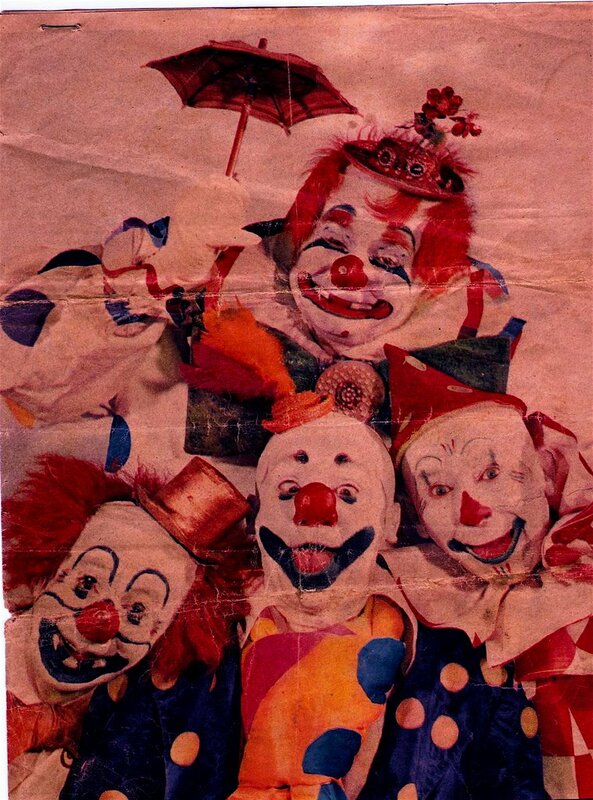 Quite a collection of circus autographs! 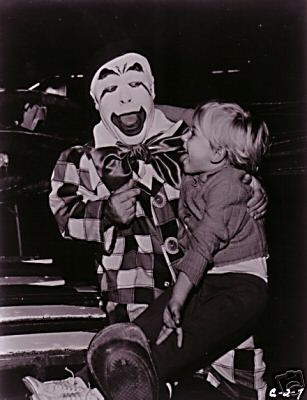 The photo is of yours truly and Irvin Feld on the night of December 9, 1968, just after the first Clown College graduation ceremony and performance had concluded. As to who came up with the idea of Clown College, through the years, I've heard many different versions. 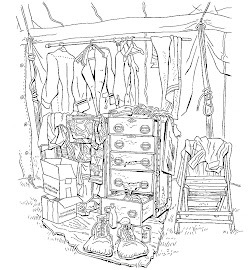 I do recall it being said at the time of the first session that Israel Feld, the "quiet brother" and a terrific, delightful gentleman, came up with the idea and championed it to his brother, Irvin. Who knows? Enjoy! And "May All Your Days...." Nevermind. I'm repeating myself. I have to dig around and post a series of pictures of the Hanlon Brothers and some info on the Hanlon-Lees. 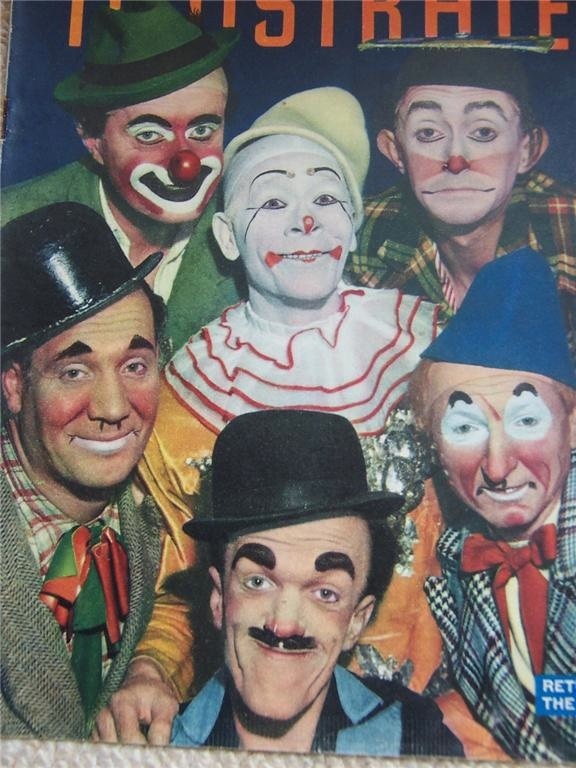 Mike Naughton: See what I mean about the eyebrows being thicker on the headpiece in the 50s/early 60s? A classic moment, again in the 40s. These look like three cops, not gas station attendants and I don't see a gas pump in the ring. I wonder if the gag had a different premise in it's early days? Water skiing with former Alf Landon cohort Mike Padilla at the wheel of the boat in 1967. Wait a minute! 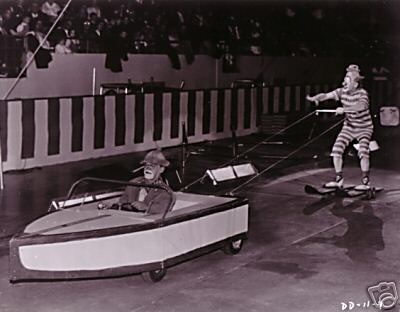 Lou takes off his hat when he bathes in the bathtub but not when he water skis?!? It must be a German thing! The entirety of Lon Chaney's 1928 classic, Laugh Clown, Laugh, presented here without music. So set your iTunes, grab some popcorn and enjoy tonight's feature presentation. 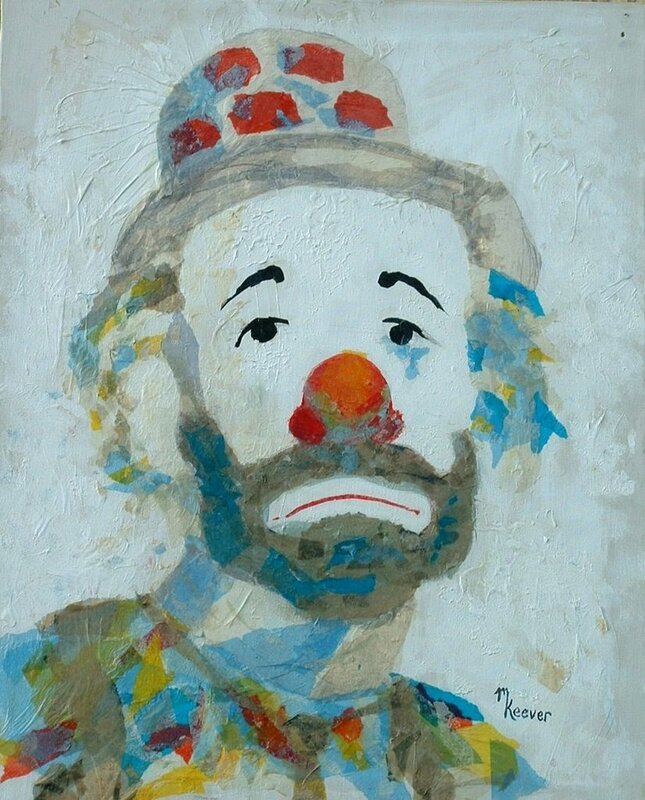 If it's Sunday morning here in THE ALLEY then it's time for more artwork from Cowboy Mike Keever. We are proud today to have the honor and priviledge of presenting to you his collage of the one and only, Emmett Kelly. Some recent photos of Mitch Freddes (top) and Tom Dougherty (bottom) from the Ringling Gold Unit. These two men are really doing outstanding work RIGHT NOW! 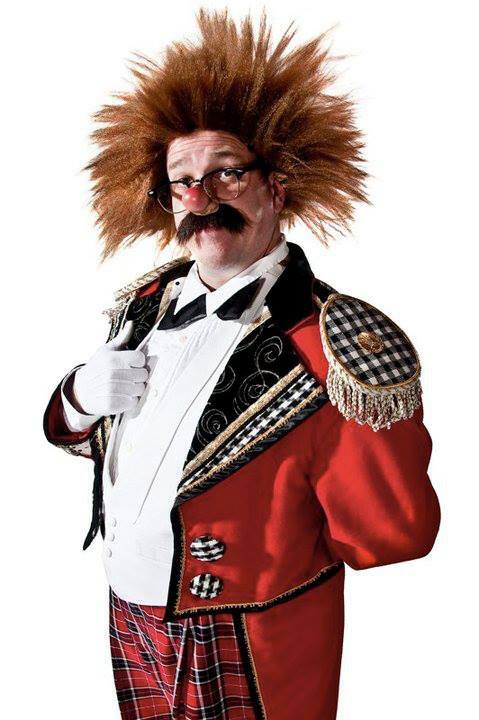 I would strongly encourage those interested in seeing some of the best circus clowning in America to catch the show when it comes to your area.